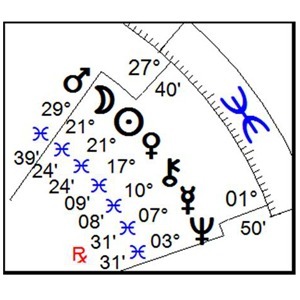 In order, from right to left, Neptune, Mercury, Chiron, Venus, Sun, Moon, Mars 7 out of 11 “planets” in one sign. This is no cosmic happenstance. This is SO HUGE it’s very difficult to even discuss. All five personal planets are there, Sun, Moon, Mercury, Venus & Mars. Plus the powerful Chiron and Neptune conjunction. There are no books anywhere that can explain this. The expression of this group will be felt all through March – and probably longer. Remember, this is all going on while Mercury is retrograde and Uranus and Pluto are in the midst of a 3-yr-long fight between Aries and Capricorn, respectively. Never mind those for now. Since Chiron was not discovered until 1977, it is the first astrological pairing of these two powerful bodies in the skies ever. Neptune, the planet that insists upon Oneness, along with Chiron, the “Centaur” that represents healing wounds have been traveling together for about the last 4 years. Combined, these last two are insisting upon a world that heals itself, and I mean everyone. Now, add FIVE more Piscean planets to the mix. Meaning: We are getting an absolutely phenomenal, numinous influx of Divine Grace blanketing everything. Do you think it’s a COINCIDENCE that the “Pope” is stepping down now? Think again. Pisces is all things spiritual and is the natural home of the most spiritual planet, Neptune. And, Neptune and Chiron seem to be getting along famously in their dual task of enlisting Light-Workers! Translation: The Powers that be, God, Source, The Divine, Angels, Guardians, Spirit Guides, whatever you want to call them KNOW that we’re going down the drain very fast here on Earth, and are interceding in our behalf to save us. Think I’m joking? Almost every client I see wants to become a light-worker and help out humanity. Where did this urge come from? Urges DO NOT come from “YOU”, they come from universal, collective archetypal forces. In other words, even though our priceless egos can’t stand hearing this old refrain, we’re all connected. What got into you lately? What got into her last week? Same thing. That’s exactly what I’m talking about. Many people are feeling off-center right now or at least are confused. That’s BECAUSE we’re getting such a high dosage of Piscean energy as the 5 planets now in Pisces await 2 more including the New Moon. This is the MAIN reason this conglomeration in Pisces is here and now. It is being felt by people all around. It is not KIDDING. It is saying to each of us in our own way, “I love you, I support you, Listen to me” – Signed, your inner Voice, The Holy Spirit, Source, God, Goddess, Allah, whatever. Our psychic spiritual openings now are NOT OUR IMAGINATIONS. This is real and this is wonderful. Life- and planet-saving wonderful. Do NOT get caught up in HOW WILL THIS MANIFEST IN MY LIFE? God knows. YOU DON’T. But, “He” does. (If he’s awake by now.) Why do you think organized religion is satisfying less and less people now? They want the direct, honest experience of God now. If you find solace and above all Truth in your spirituality, by all means continue. This surge is NOT favoring one religion over another, it’s just trying to convince you of your personal INTIMATE relationship with your “Creator”, “Source”, “_______“, whatever name you are comfortable. I’ve told you many times, and this is true, if you hold on to materialism now, you.will.lose. And maybe in a big way. If however, you put your material possessions in perspective, you probably will not lose, but gain greatly. When we get overwhelmed by a single sign of the zodiac, it’s never good, in the sense that we are tilting, way off balance. Indeed, if it has to happen anywhere, best it happen in Pisces since Pisces is all-inclusive and all about unconditional love. Perhaps this is signaling the ending of the 2050 years-or-so Age of Pisces and giving way to the Age of Aquarius. We all know it. If we don’t start working for WE, there will be no more earth for ME to be on. Enough of that soliloquy. Since all archetypal energies have their down-side or shadow-side, we must be ever vigilant of the darker side of Pisces: escapism, extra-marital affairs, lies, deception, theft, psychosis, refusing to see the truth, lying to yourself, and all kind of underhanded attempts to ‘get to the promise land.’ Heck, even political parties get caught up in these smoke-and-mirrors attempts; nah. These energies feel weird because we’re getting so much of it at once and it is unbalanced. The phenomenal potential of this is to open your heart and get on with true spiritual development. This has nothing to do with how much you tithe, or writhe at night with your spiritual dark nights of the soul. Let go of trying to do a better job than God can do (As “A Course In Miracles” insists we are always attempting to do. Let go, this Pisces energy is here now to help you. It is intelligent! I PROMISE. You may feel extra-enlightened during the next few weeks and that’s great. This is no fluke. If impure things in your life have to go bye-bye now, bless them, and release them. God is speaking. Loudly. Are we listening?